In various early publications, I came across references to three items related to David Kennison that were known to be in the collection of the Chicago Historical Society. Those three items were: a vial of tea sealed with red wax, an affadavit professing the authenticity of those tea leaves as being from the Boston Tea Party, and a dagguereotype portrait of Kennison. 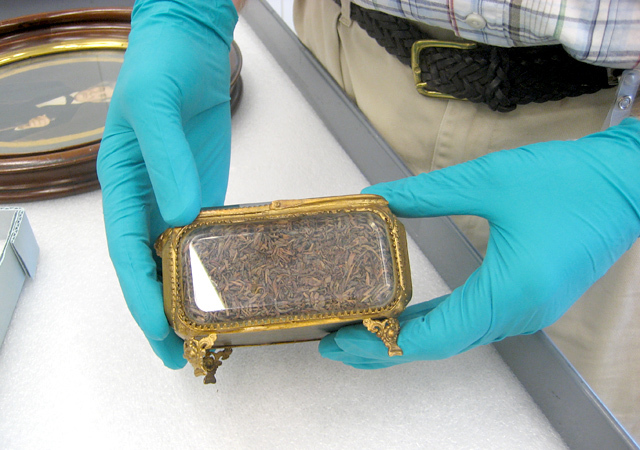 Today's Chicago History Museum has three objects in their collection that are connected to David Kennison: some tea, purportedly from the Boston Tea Party, an affadavit proclaiming the tea's authenticity, and a painted portrait of his likeness. Of the three items, only the affadavit regarding the tea leaves is the same object from the earlier grouping. 1894: forty-two years after David Kennison's death, news of the existence of tea leaves in the possession of Fernando Jones is published in a Chicago newspaper. Jones mentions the affadavit, and explains the little bottle of tea came from David Kennison's pockets. The leaves were purportedly left in the possession of Kennison's mother, who kept them in her cupboard until Kennison retreived them years later. 1901: Fernando Jones has two vials of tea. 1903: Jones's tea leaves came from David Kennison's boot, where they had accidentally fallen during the Boston affair. 1908: Chicago Historical Society acquires photo reproduction of a daguerreotype of Kennison. 1912: Chicago Historical Society acquires vial of tea and affadavit declaring its authenticity. 1939: CHS is acknowledged to have a daguerreotype of David Kennison. 1975: CHS has "2 ounce vial of tea sealed with red wax," accompanying affadavit, CHS also has a painting, and pictures of Kennison. “Yes, sir,” said Fernando Jones, “I’ve got a little bottle of that very tea that was on board the ship the night of the Boston tea party. It is sealed up and I have with it a certificate from Kennison that it is the genuine article. Kennison often related the story of the tea party. He said after he went home and took off the Indian togs which all the fellows wore during the attack on the ship and while they were dumping King George’s tea overboard he found his pockets full of the tea. He put the tea in a canister and took it to his mother, who was fond of good tea, but she would never touch any of King George’s old tea. Kennison thought she would soon get over her prejudice and so she put the tea away in an old cupboard. Years rolled on, the war was over, the old Kennison homestead had been sold when David went back one day to the old place. Rummaging around in the garret he found the cupboard and in it the canister of tea just as he had left it." Mr. A.W. 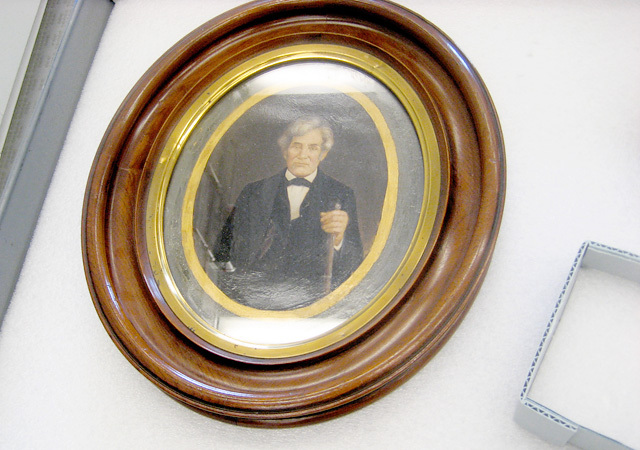 Wheeler has presented a photographic copy from a daguerreotype portrait of David Kennison. Belonging to another era, it might almost be said that David Kennison is not within the “field” of this Society. The rough boulder which marks his last resting place was erected by the Daughters of the American Revolution. But since he was doubtless the “Oldest Inhabitant” of his period in Chicago, in point of years, and since the conservation of historic data and the marking of historic spots is part of our province, we are glad to place among our gallery of Chicagoans this veteran campaigner of Boston. Fernando Jones died on November 9, 1911, at the age of 91. In the Chicago Historical Society's annual report, there is the acknowledgement of the acquisition of a vial of tea and an affadavit asserting its authenticity. The Chicago Historical society has among its exhibits a packet of tea which came from the cargo he helped to throw into Boston harbor. Anyway, Kennison said it did, and therefore the souvenir is regarded as authentic. A daguerreotype of the centenarian may also be seen there. Three years before he died, Kennison gave to his friend Fernando Jones, a vial of tea he had saved from the Boston Tea Party as a memento. The tea which is in a 2-ounce vial sealed with red wax, has an attached note which says: "I declare upon my honor, that the tea contained in this vial is a portion saved by me from cargoes thrown into the sea from ships in boston harbor in the early evening of 16th of December, 1773. Today the vial of tea can be seen at the Chicago Historical Society, along with a painting and pictures of the old revolutioner." The society also has on exhibition an actual vial of tea saved from the Boston Tea Party by David Kennison, the last surviving member of the raiding party, who died in Chicago at age 115 in 1852 and who lies buried in Lincoln Park. Chicago Historical Society, September 1987, exhibition catalogue, "We the People: Voices and Images of the New Nation." In this extensive catalogue for an exhibition detailing objects from the era of the Revoutionary War, the David Kennison objects in the museum's collection are illustrated. The text accompanying the three pictured objects from their collection is a published acknowledgement of the tarnished Kennison legacy: "In reality, he was about eighty-five when he died. He was about seven at the time of the Tea Party, and, in 1780, at seventeen he was rejected by the army as undersized. He was indeed a veteran, but of the War of 1812, in which he was wounded and for which he received a pension. A poor laborer, he worked on farms, moving from main to Vermont to New York and finally to Chicago in 1845. There he found an audience eager to embrace a living link to the Revolution." The three objects illustrated in this catalogue are the same that remain today in the museum's collection. Chicago History Museum, June 2007, the exhibition, "Is It Real?" For this exhibition, curated by Peter Alter, objects from within the museum's collection were presented with thoughtful text panels questioning the objects' claimed significance. I visited Peter Alter in the museum where he showed me the Kennison items in their collection. 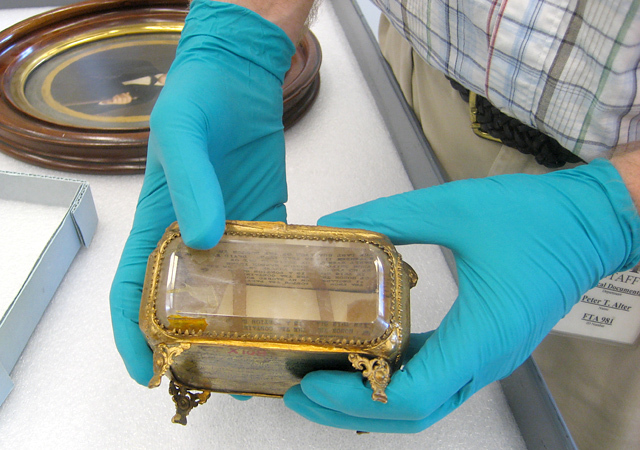 I asked to see the daguerreotype portrait, and he said there was no such item in the collection. When I inquired about the vial of tea sealed in red wax, he said he had never seen such an item. He showed me the tea leaves. They were contained within the same chest that was pictured in the 1987 "We the People" catalogue. Some time between 1982 and 1987, the vial of tea had become a chest of tea. But what looks like a full container of tea leaves, is actually a falsely fashioned front containing a very small quantity of tea. In this last Hidden Truth mystery regarding David Kennison, the newer container for the tea leaves, is actually an item from from the 1893 Columbian Exposition. It is a replica of the golden chest that held the ashes of Christopher Columbus. Peter Alter does not know how the tea ended up in this container. Courtesy of the Chicago History Museum. This unsigned painted portrait of David Kennison looks like the image from the daguerreotype that was illustrated in 1850, in Benson J. Lossing's, Pictorial Fieldbook of the Revolution. Peter Alter, curator of the 2007 Chicago History Museum exhibition, "Is It Real?," holding the chest of David Kennison's tea. Peter Alter, showing the back side of the chest, revealing the false front that contains the tea.